AWESOME PROJECT: Help send passionate NYC cyclists to Seattle, for Youth Bike Summit 2015, to connect with their larger community! Joe Matunis is a lifelong cyclist; he grew up in rural Pennsylvania, where he had the wide-open space to discover the joys of biking very early in life. So after 20 years as a science teacher at Williamsburg’s El Puente Academy for Peace and Justice, it made perfect sense that he launch a bike club for his students. Most El Puente scholars commute from East New York – that’s over an hour on public transit, even on a good day – and don’t have access to a culture of fitness. The girls especially, Matunis says, because they don’t tend to be as interested in basketball as the guys are, are coming into the high school at healthy weights and leaving overweight. He wanted to get his students moving, and he wanted them to experience the sense of freedom, mastery, autonomy, renewal, confidence, and clarity of mind that he’d always known a good ride could bring. 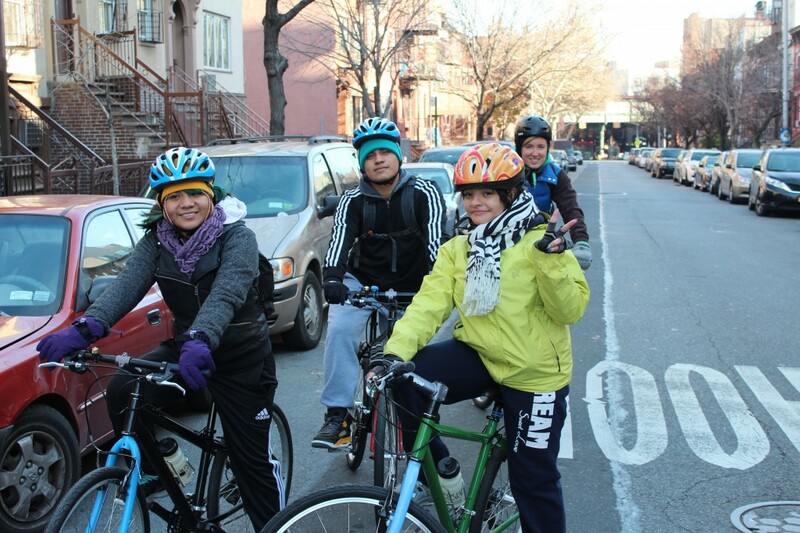 Cut to two years later, and already the El Puente bike squad is unrecognizable. Kids who’d never stepped onto a bike, who’d been leery of all the gear changing and signal-giving and hectic traffic, who’d been maxed out after just a couple of miles in the saddle, are identifying as cyclists. They’re talking about going to colleges where they can bike. They’re joining in for the one weekday morning ride that Matunis guides (before classes start, as the DOT won’t let students ride with teachers during school hours) and the long weekend ride. They’re logging hours upon hours taking apart, tinkering with, and learning to fix up old frames donated to Recycle a Bicycle, and eventually earning their own first bikes to keep. They’re racing the 40-mile Tour de Bronx. And they’re asking for more. That exposure to youth bike culture, says Matunis, was hugely important for his students, and absolutely inspired them to up their game. They started taking longer rides, reaching higher. They started to feel a part of a larger movement – one that’s unquestionably heating up in NYC right now. One rebel El Puente cyclist, who’d always refused to join in for the long group rides because he didn’t want to wear a “dorky” helmet, even began to change his tune there. Here were hordes of kids at the summit, from all over the country, comparing this helmet to that one as if there were no cooler headgear on the planet. This year, the Youth Bike Summit is taking place in Seattle, which is a long way away for a school with not a lot of money to burn. But Matunis and the El Puente squad won’t be deterred. They’re forging ahead, and they need your help. Here’s their ioby campaign, which includes an awesome short video with interviews from core quad members. Matunis brought his observation to the students, who decided to formally investigate the relationship between stress-relief and biking. A core group of four girls and one guy went ahead and polled the entire high school, compiling and analyzing their research. Tellingly, this is all extra-curricular work. They’re doing it not for credit, but for passion. They’ll present the fruits of their labor in Seattle on the weekend of Feb 13-15. 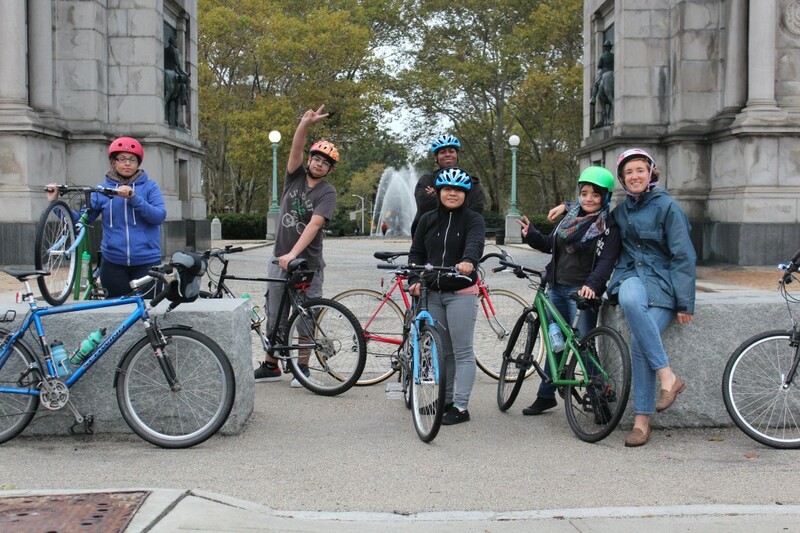 Also on the docket for this year’s Summit – they’ll be presenting a documentary titled Bicycle Stories: what my bicycle means to me, my family, my community, my planet – is another group of NYC students racing against time to raise funds for their trip to Seattle. The International High School at Union Square is a fascinating place. With students coming from literally all over the world, many from regions of conflict, you’ll hear more than 30 languages spoken in the corridors of the ambitious school. That makes biking, for those students involved (roughly ¼ of the 300-something student body are involved in the cycling program in some capacity, whether that be taking the actual rides, or working on the bikes, or getting into cycling advocacy) something of a universal language, and certainly a bit of relief from the enormous stress of recent immigration. 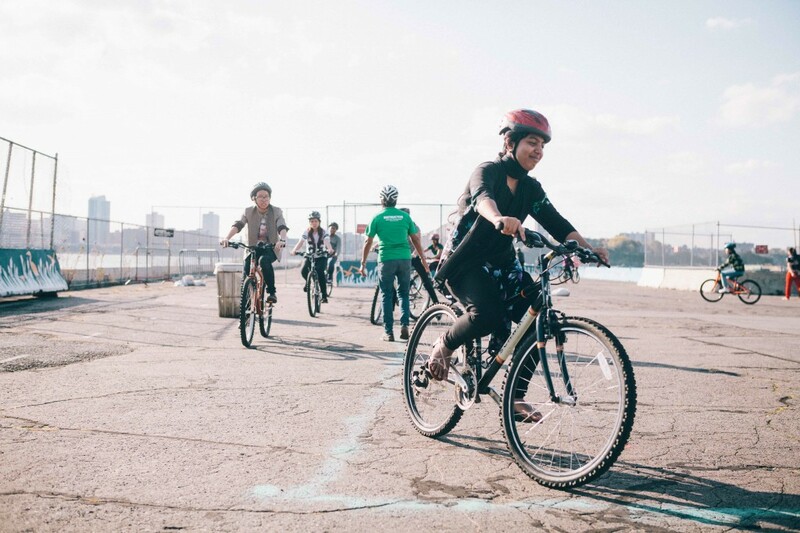 Klein herself grew up in New Jersey, but didn’t really discover biking until she moved to the city to teach. She remembers one particularly transformative ride, which saw her soaring through Chinatown at night. She sounds awe-struck when she describes how different the city suddenly looked to her, from her new vantage point. It wasn’t long before she was a fully-fledged convert, commuting to work by bike, along with many of her fellow teachers. For Klein’s students, a bike is often not just a way to get from A to B, but a way of going back in time – to childhood, and to the bikes they’ve had to leave behind in their home countries. 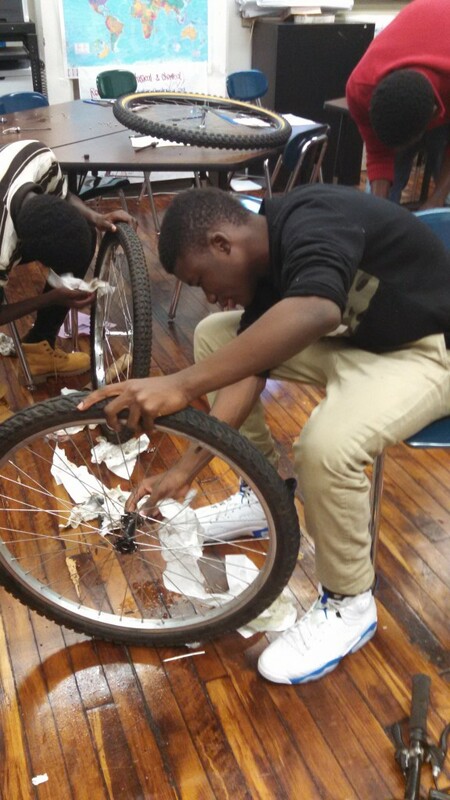 One student, originally from Senegal, arrived as a ninth grader with almost no English, but immediately approached his teachers to say: “bike, I need a bike.” He’d had to leave his at home, and desperately missed that feeling of being able to map his own course. He’s now a 10th grader, and in the process of earning a bike through Recycle A Bicycle’s earn-a-bike program, and (see the photo below of him tuning it up!) could not possibly be more devoted to his new friend. It’s precisely because of that kind of devotion and kinship that Klein’s students decided to make a documentary about their relationships to their bicycles, and to share their stories with the national youth bike community. They’re making the film on a budget of exactly zero, but desperately need to raise the rest of the money that they need to see them through the weekend in Seattle. Airfare is bought and covered, but they need $1,500 more to cover rooms at Hosteling International (which has given the group a generous discount) and meals. Imagine sending two teachers and four students to Seattle for an entire weekend – on only $3,000 total! That’s what we call some serious budgeting, so you can feel super confident that your donation will go a LONG, long way. Like, 40-mile, Tour de Bronx long. Click here to donate, and to read more about the documentary. Matunis and Klein come from such different schools, but ask them about why they launched their respective bike clubs, and you’ll hear the exact same unbridled enthusiasm in their voices. They are beyond proud of their young cyclists, beyond thrilled to have been able to bring the much-needed joys of biking – and the biking community – to their schools. The summit this year falls on Valentines Day Weekend – Feb 13-15. What could be more fitting, given how these young NYC cyclists have fallen for the freedom of a simple bike ride? Something tells us that this’ll be a lifelong love affair for them, so please consider helping Matunis and Klein reach their goals just in the nick of time. This week’s the final crunch. $150 covers hostel fees for one of Klein’s students at Hosteling International, and $200 covers meals for one of her students. But every little bit counts. It’s in the name of true love!